This should really be brief. We had lunch here not too long ago and noticed the breakfast menu, so we’re back for some a.m. eats. The place and service haven’t changed a bit but they are about to. A sign inside the door says they are moving. I would bet it has more to do with the location than the building. Getting in and getting out take quite a bit of doing and they don’t have a menu that lends itself to feats of navigation or stunt driving for a visit. We ordered the early riser, hash and eggs, a biscuit and gravy and French toast. 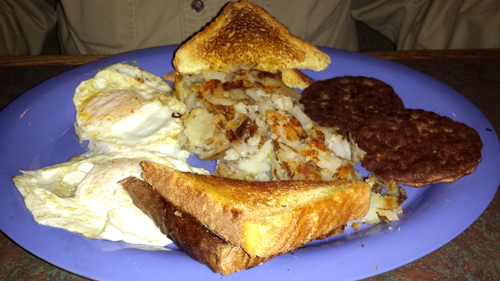 The early riser comes with two eggs, two sausage patties, toast and home fries. I understand everything was just what you would expect, solid, comprehensive American breakfast. The home fries work well for me but Steph would tell you not to get them. They are loaded with onions and the onions are well concealed making them delicious (to me) and problematic to others. 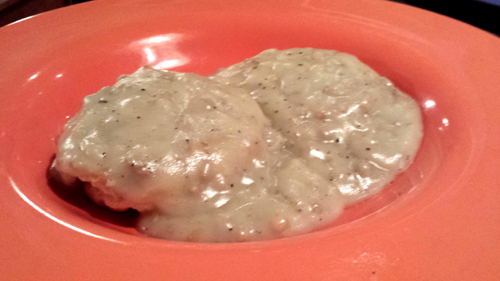 The biscuit was passable and the sausage gravy was really non-descript. I’m still looking for an outstandingly cravable version somewhere close but it eludes still. 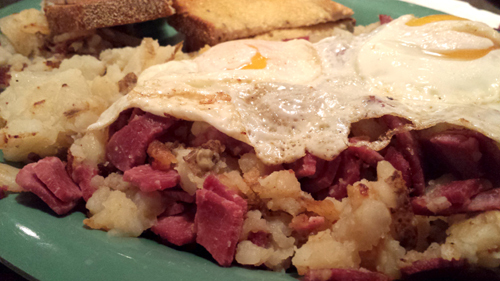 The corned beef hash was also mediocre, same hash browns, chopped sandwich slices of corned beef, two perfectly done EOE, it was fine. I much prefer small diced everything all packed on to something stupid hot to impart that dusky crust which was nowhere to be found here. The eggs were on point regardless. 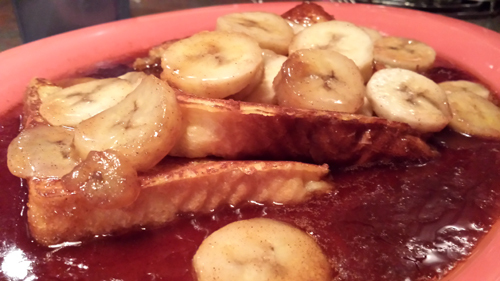 Steph tried the French toast with the bananas foster option. Thick slices of custard-ed(?) -ey(?) bread were griddled and laid in a sweet and thick puddle of caramelized brown sugar with orange and cinnamon. Slice a whole banana into the same goop and you end up with an above average if seriously sweet breakfast that still could have used a hint more orange, but pretty good. 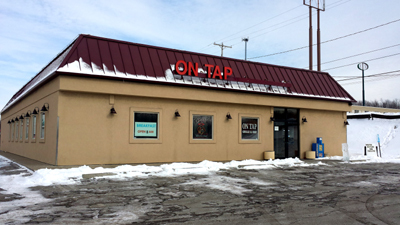 On Tap twice has delivered functional and very fair meals. I wonder where the next location will be. Might be worth a visit.